Looking for something to do during your free-time? Mission Springs has 200 acres you can explore on our extensive trail system as well as some traditional sports activities. These activities are all included in your rate package (except where noted). See Rates page for more detail. (Seasonal; Memorial Day-Labor Day) Check out these great Program Options for your group while you retreat at Mission Springs. Our Program Team is ready and waiting to schedule your next free-time with one or more of these adventure activities. 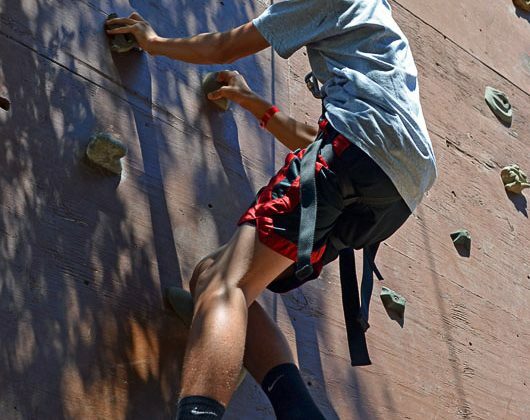 At 40’ high, the climbing wall offers multiple routes to the top. Whether your group has first-time or more advanced climbers, there are climbing routes that will challenge everyone! 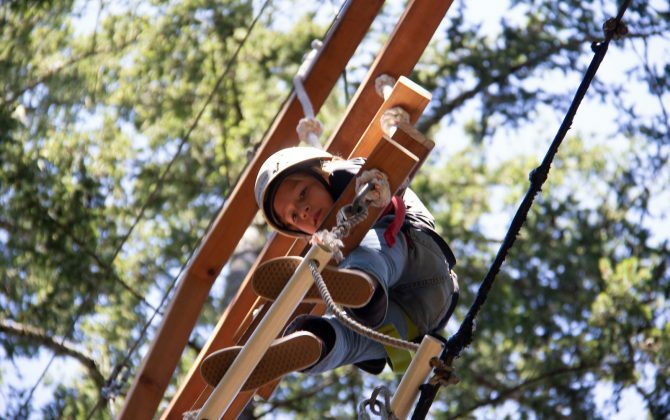 Your journey begins as you climb the stairs to the top of the 40’ Zip Line Tower. 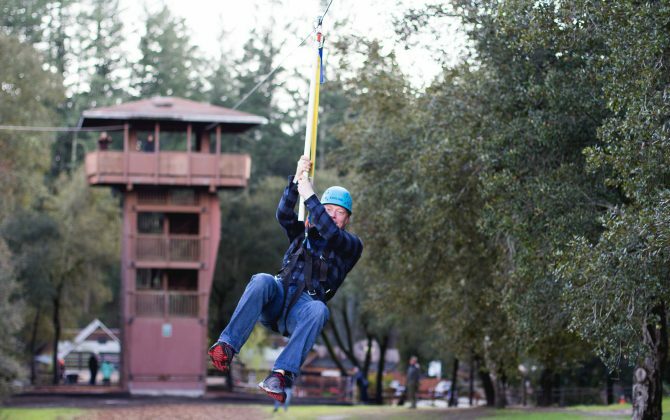 Once our facilitators securely clip you in, you can step off the platform and take an exhilarating ride down our 300’ Zip Line. We use a stride landing system, which means that once you are approaching the end of the zip line you will slow down significantly as your feet near the ground. This will enable you to take the landing “in stride,” and begin to stand up once your feet are able to touch the ground. Meaning that in order to participate you must be able to engage in the stride landing. Consisting of three separate and unique belayed elements, this course is perfectly designed for groups with a wide range of comfortability with heights. And at 40 feet in the air, you will find even your most experienced climber’s hearts racing! Experience what it’s like to be a pirate! Climb your way through a series of nets and ladders to a platform where you jump the plank at a height of 40 feet! Beat the heat with this Slip N Slide! 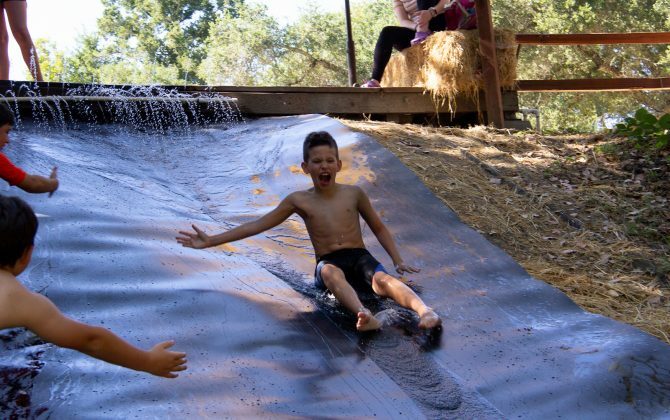 There’s no better way to stay active and cool with friends than a good old Slip N Slide! Enjoy a thrilling ride down 220ft of slick tarp. Made to enjoy by all ages. Group Size: No cap on group size! Led by one of our knowledgeable facilitators, you will be guided through the three ecosystems of Mission Springs starting from the Outdoor Education Museum and ending at the Eagle’s Landing lookout deck. During the hike, short breaks will be utilized to point out some of the natural features found throughout Mission Springs. The guided nature hike lasts approximately 90 minutes. Age Minimum: People of all ages can participate, but please be advised that the trails at Mission Springs are mostly uphill and downhill, so a good dose of cardio should be expected! Mission Springs is just 6 miles from Santa Cruz and its beaches. Enjoy the many local points of interests in this great region of California.